Camp Castle is noted as a dun by Hendry, and a broch by Feachem. Set on bare rock on the uneven summit of a hillock, a brief excavation was carried out on it in 1961. It consisted of a wall, 15ft thick, which enclosed a circular space 30ft in diameter; only foundations remain. Huge undressed boulders form the outer and inner faces; the space between is packed with rubble. Part of a mural chamber, 5ft wide, was exposed. On the W side, much of the wall has been removed, probably to build dykes. I A Hendry 1961; R W Feachem 1963; letter and plan from K A Steer, 13 October 1953 and 16 April 1954. 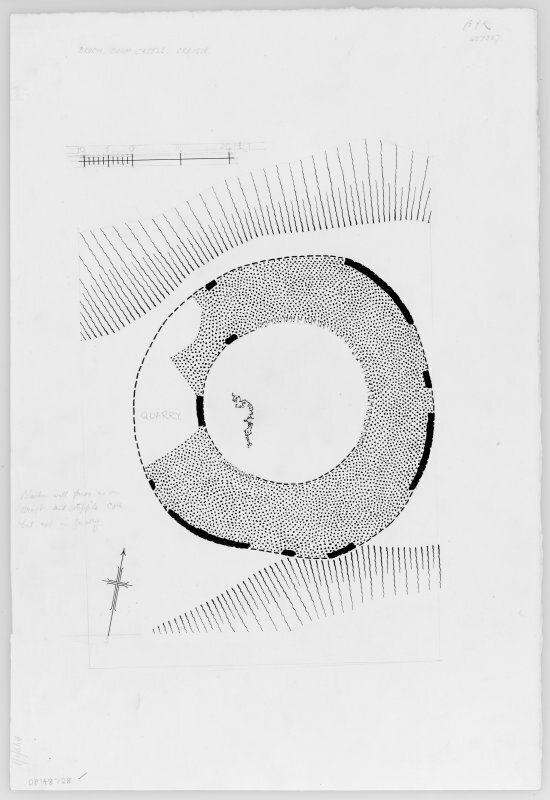 When visited in 1954, Camp Castle was described as an almost circular enclosure, possibly a dun, about 19.0m in diameter, formed by a barely traceable wall, 3.0m - 4.0m wide. Large, rough blocks of stone marked the outer face of the wall on the E and S, while the W had been destroyed by quarrying. The inner face was not clear and the entrance was not apparent. Camp Castle: name unverified. The remains of this dun are generally as described and planned. It is mostly turf-covered. What is probably a broch is situated on a rocky knoll 270m W of Meadowhead farmhouse. The broch is roughly circular, measuring 19,5m from N to S by 19.1m over a wall at least 4.8m in thickness; only five inner facing-stones are visible, all of them on the W, but there are stones numerous outer facing-stones, especially around the E and SW. The facing-stones are large irregular blocks measuring up to 1.1m by 0.8m and 0.5m in height. This site is noted in the ‘List of monuments discovered during the survey of marginal land (1951-5)’ (RCAHMS 1957, xiv-xviii). The 286 monuments were listed by county, parish, classification and name, and the list included an indication of whether they had been planned (P), whether they were visible only as a cropmark (C), and whether they were worthy of preservation (*). 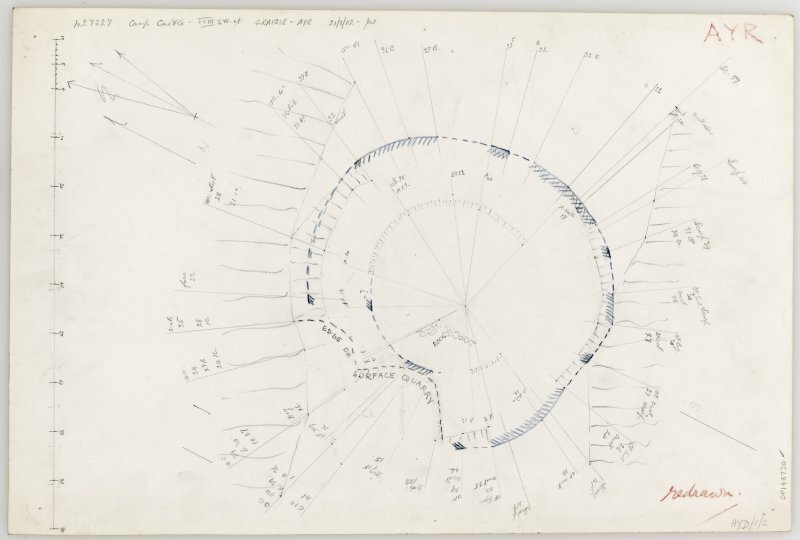 Drawings are catalogued to individual site records. Investigator's notebooks are availiable in the MS collection. Site descriptions are availiable in contemporary RCAHMS inventories, or in three typescript volumes availiable in the library. This probable broch in Craigie stands on bare rock on the uneven summit of a hillock, 270m west of Meadowhead farmhouse. It was first described as a dun in 1961, when a brief excavation was carried out , and then as a broch by Feachem . A wall 4.58m (15 ft) thick was found which enclosed a circular space 9.15m (30 ft) in diameter. Only the foundations remain, consisting of huge undressed boulders forming the outer and inner faces with the rubble core between. Part of a mural chamber 1.53m (5 ft) wide was exposed. On the west side, much of the wall has been removed, probably to build dykes. The facing stones are large irregular blocks measuring up to 1.1m by 0.8m and 0.5m in height . Dimensions: the overall diameter is 19.5m from north to south by 19.1m over a wall at least 4.8m in thickness . Sources: 1. NMRS site no. NS 43 SW 2: 2. T A Hendry in Discovery and Excavation in Scotland 1961, 25: 3. Feachem 1963, 163: 4. RCAHMS 1985, 11, no. 38.